A Greenhouse is an excellent investment for any keen gardener, making growing and maintaining a variety of plants easier throughout the year and provides shelter from adverse weather conditions such as frost, snow and heavy rain. All of which are far too common in the UK. If you are interested in growing different crops which may not grow in a UK climate a greenhouse can prove essential and means that you can grow a variety of different plants. GBC group have a wide variety of greenhouses from respected brand leaders. They boast quality and durability in their products and vary in size, material and shape. The type of greenhouse you chose can depend on a variety of things including; the size of land, budget, gardening expertise and growing potential. Usually it boils down to space. If you are an amateur gardener you may be best investing in a smaller greenhouse as to not overwhelm yourself. The most popular material which is used for greenhouses is aluminium as it is long wearing, durable and does not rot or rust however there are other alternatives such as wood or resin greenhouses. The material you choose would depend mostly on size and location of your greenhouse. When deciding which greenhouse to invest in there are many factors which you should consider including the positioning. This would include making sure that the greenhouse is sheltered from wind, but not under or near any overhanging trees and still easily accessible for both ease of use and maintenance. It is also important to consider the positioning of the greenhouse in terms of services such as water, as it is necessary that water be able to reach the greenhouse. You should also consider factors such as heating, glazing and venting. If you are planning to grow crops which would usually grow in a warmer climate or aim to grow seasonal crops all year round then you should consider getting a heated greenhouse as this would create a warmer climate all year round. Glazing refers to the strength of the glass, it is worth investing in a tougher glass as this will improve the durability of the greenhouse vastly. Venting is important as it reduces humidity levels. You can have auto vents which adjust according to the weather so you don’t have to worry. Now for the legal stuff; as it can be considered a building it is important to know the rules and regulations surrounding greenhouses. If you are hoping to avoid the process of gaining planning permission this is what you need to do. Make sure the greenhouse is no more than one story tall and less than 3m in height. It needs to me at least 2m away from any boundary and it cannot cover more than half of the land around your home. If you are someone who is interested in the visual aspect of your garden you may want to consider how visually appealing your greenhouse is going to be. 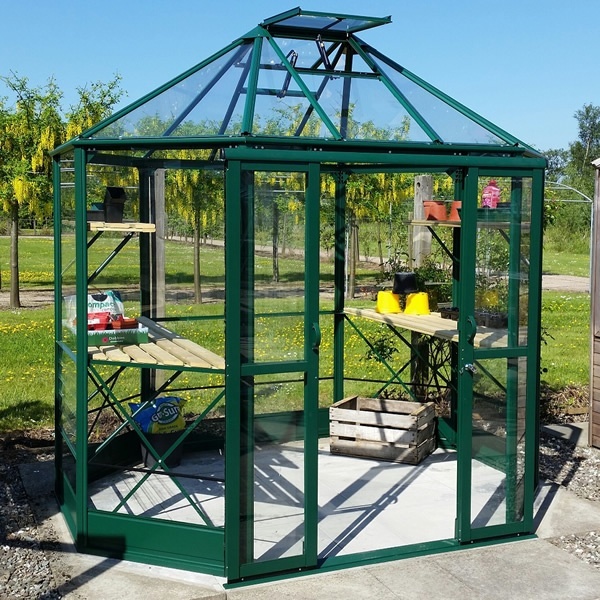 The standard and most popular style of greenhouse in the UK is the freestanding greenhouse however the octagonal greenhouse tends to be more visually appealing and may be of interest to anyone with an eye for aesthetics.